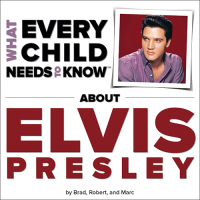 On the 60th anniversary of Elvis Presley’s first single, “That’s All Right,” Brad appeared on KTVK’s Good Morning Arizona to discuss our What Every Child Needs To Know About Elvis Presley board book. We hope the book will help to create the next generation of Elvis fans. It is available at your local, independent bookseller, via major, online retailers, and at the Graceland gift shop in Memphis!